Nestled in the foothills of the Italian Alps, the village of Becchi became home to Giovanni (John) Melchior Bosco on August 16, 1815. This little baby would grow to be one of the leading lights during the troubling times of the nineteenth century. His profound influence can be seen even in our own day as we mark 200 years since his birth. Let us now look back on the life of Saint John Bosco, the heroic Apostle of Youth. When John Bosco was but two years old, his father, Francesco Bosco, passed away. His widowed mother, known by all as “Mama Margherita,” worked tirelessly for the survival of her family. The time after the Napoleonic wars was marked by famines and hardship. Young John Bosco and his two older brothers worked long hours each day in the fields. Mama Margherita made sure every activity began and ended with prayer. The mother’s influence assured each of her children thanked God for providing the little they possessed. As a child, John Bosco enjoyed visiting the fairs and festivals of nearby villages. The magic shows and acrobatics greatly impressed him. He watched carefully and learned all he could from these traveling entertainers. By the time he was nine years old, young John Bosco could be seen putting on his own shows. Tightrope walking, juggling, sleight of hand and puppetry attracted many of his contemporaries, sometimes 100 boys at a time watching. The price of admission to these shows? “Let us say Our Lady’s rosary,” said the young showman; his audience knelt and gladly obeyed. Showing zeal for his friends, he led prayers before and after each performance, and insisted each boy frequent the sacraments. The dreams of John Bosco came and went, but his gifts and talents soon manifested themselves to one and all. When walking home after a mission in a nearby town, he saw a priest walking at a distance. Catching up to him, the two conversed at length. John Bosco impressed the priest with his incredible memory when he recited the entire sermon given that evening word for word. The next week the priest began giving him private instruction. Due to family hardship, John went to live and work on the farm of Signor Moglia. A priest who was related to this family came to stay one summer, and was so impressed with the bright boy he began giving John daily lessons. The same continued for two years, and every Sunday John walked to the nearby parish church to instruct the local boys and continue his one-man shows. Concerned with his lack of schooling, a generous uncle provided for John Bosco to begin attending the local high school in the fall of 1830. At the high school at Castelnuovo this fifteen-year-old lad excelled, despite his lack of formal schooling. This star pupil finished the courses of three academic years by the spring of 1831. The local tailor at Castelnuovo took John into his home, where the young man learned this trade that would serve him well in the future. In the fall of 1831, John began seminary studies at Chieri. His living conditions with the owners of a local restaurant taught him to be on his guard against bad company. John’s deeds by word and example attracted the good and made enemies of the bad, a pattern that would repeat itself throughout his adult life. On June 5, 1841, the Archbishop of Turin ordained John Bosco, at the age of twenty-six, to the sacred priesthood. At his first Mass, he later recounted asking especially for the gift of efficacy in word in order to do good to souls. The people afterward addressed him by his Italian title for the first time, and the name of Don Bosco would one day be known the world over. Given his choice of assignments, Don Bosco opted to remain at Turin for further studies. The Industrial Revolution marked the city during this period. Thousands were moving in from the countryside looking for work in the factories. Boys as young as ten years old could be found working long shifts and living on the streets. On the Feast of the Immaculate Conception, Don Bosco saw his sacristan throw a young boy out of the sacristy. Approaching the lad and asking him questions, Don Bosco learned Bartolomeo, an illiterate orphan of fifteen, knew neither his prayers nor catechism. When Mass concluded, the instructions commenced. Bartolomeo returned the next week with six others. Soon growing numbers met every Sunday with Don Bosco teaching these unlearned youth, many of who did not know even the Sign of the Cross. It wasn’t long before Don Bosco had quite the following. His new apostolate became known as the Oratory of St. Francis de Sales, after the great bishop of Geneva whose kindness won souls for Christ. The spiritually starved boys from around Turin and beyond came in increasing numbers to learn the beautiful truths of the Catholic Faith. Don Bosco’s fellow priest, Father Borel, soon joined him, and the two began giving evening classes for the boys working in the factories. When Don Bosco completed his studies, the Oratory was forced to move. His rowdy crowd of youths met at St. Philomena’s Hospice in a small room converted to a chapel. Months later his group of boys met weekly at a chapel in the local cemetery. When this option ceased, the wandering Oratory three hundred strong met weekly for treks into the countryside. With the approach of winter, rooms were rented, but the Oratory was forced to move three more times. Don Bosco gave every hour of every day to his boys. He visited them at work, counseled them in their problems, nursed them in illness and attended their every need, spiritual and temporal. Opposition to Don Bosco’s work came from all sides. Newspapers carried reports decrying the Oratory as a menace to public order. Politicians called for an end to these gatherings of street urchins with this poor priest. The clergy complained to the Archbishop of Turin, begging him to reassign Don Bosco to parish work. Don Bosco labored on in spite of every hardship, persevering in the work he had begun. The dream started to become reality when a man rented a large decrepit shack to Don Bosco. At last the Oratory had a home, which would become permanent. Tragedy struck when Don Bosco collapsed after a strenuous day, stricken with pneumonia. Over the coming weeks his condition worsened, and the Last Sacraments were administered. His boys kept a round-the-clock vigil, praying the rosary continuously for his recovery. Asked to pray for his own cure, he replied, “Only if it be God’s will.” It seems this was enough, for in two weeks’ time he was back to his labors. As if in answer to this motto, boys flocked to the new oratory, and in 1851 Don Bosco purchased the building he had rented. The following year it was torn down and a dormitory was constructed in its place. This oratory continued to grow, and within a few years was followed by others. These schools gained the reputation of being known as the best schools for boys in all Italy. Mama Margherita was now the mother of hundreds as she joined Don Bosco in his efforts until her passing ten years later. Though the hostile authorities prohibited sales of Catholic textbooks, Don Bosco wrote his own. Teaching trades and practical skills, the saintly teacher never failed to reinforce the lessons of Catholic teaching in every activity. No greater example of Don Bosco’s influence exists than the Oratory’s “star” pupil, Dominic Savio. Arriving in December, 1854, at the age of twelve, Dominic quickly endeared himself to the other boys and was a model of every virtue. His very presence discouraged foul language and bad behavior. The young lad consecrated himself to Our Lady and expressed a desire for the priesthood. He instructed his peers in catechism and insisted on frequenting the sacraments. Falling ill in the year 1856 and ordered home by his doctors, the lad stated prophetically, “I will never come back.” On his deathbed the following March, his face filled with joy as he shouted, “What a beautiful sight I see!” He then breathed forth his pure soul to God. Don Bosco recorded all the facts of his student’s short life, and Saint Dominic Savio would become the patron saint and model for boys all over the world. With the rise of the revolutionary anti-Catholic government in the 1860s, Don Bosco faced battles on many fronts. Multiple times the government made attempts to expel all religious orders. His city of Turin saw agitation from Protestant pamphleteers, their erroneous tracts against the papacy and the Eucharist slipped into the pages of Catholic publications. With these writings Don Bosco made many enemies, but a faithful friend was sent to help. One night when coming home, a huge gray dog appeared in his path. The wolf-like animal became friendly and walked him home, but vanished as soon as he entered the Oratory’s gate. Grigio, as Don Bosco called him, would appear when needed to offer protection. The Waldensians, a Protestant sect in Turin, attacked Don Bosco vehemently for his public defense of Church teaching. These heretics even paid a group of assasins to ambush Don Bosco after nightfall. A man armed with a club followed after Don Bosco down a dark street as he hastened to reach the Oratory. Atop a hill there was another group of men waiting for him. As he dodged his attackers, Grigio appeared growling and sprang at the assailants. Terrified, they all ran off into the darkness. Grigio faithfully escorted his master back to the Oratory. 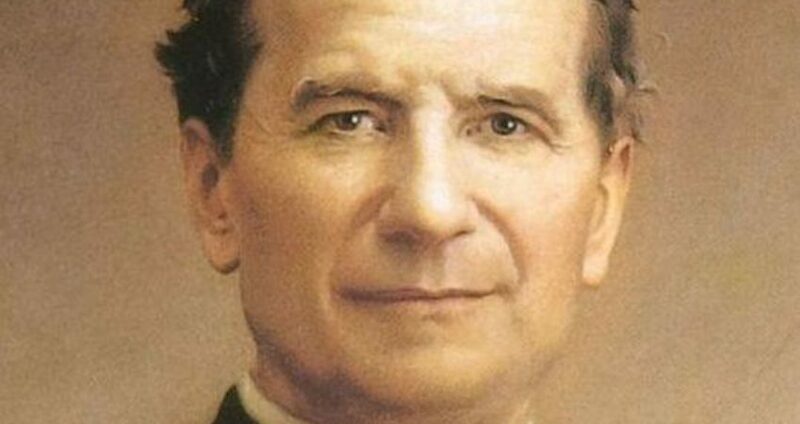 Even given this fierce opposition, Don Bosco only increased his efforts, issuing strong defenses of the papacy, the Real Presence, Our Lady’s perpetual virginity and the need for sacramental confession. His rebuttals, published in newspapers, silenced the heretics and brought back to the fold many wayward sheep. His efforts were hailed by fervent Catholics around Europe, in particular by the reigning pope, Pius IX. At Don Bosco’s first visit to Rome, Pius IX expressed enthusiasm at the idea of a new religious order for the formation of youth. Plans were drawn up and the Congregation of Saint Francis de Sales, or Salesians, took form in 1859. A female branch of the order, the Daughters of Mary, Help of Christians, was founded in 1872. Missionaries were sent to Argentina starting in 1875, followed quickly by other countries. Within a short time, Salesians counted twenty-six houses in the Americas and thirty-six houses in Europe. Requests poured in to meet the saintly founder of the new order. Don Bosco made trips throughout Italy, France and Spain. The heaven-sent dreams of Don Bosco became a reality. Years of sacrifice and heroic effort in his apostolic labors took their toll. By 1883 Don Bosco’s sight had nearly failed. Father Michael Rua succeeded him as head of the Salesians. By 1887 his legs lacked strength for walking, and by the end of the year his sufferings prevented him from offering Holy Mass. Though his body was weak, his mind remained as strong as ever. Confined to his room, for the last time he heard the confessions of his boys and gave them fatherly counsel. The final agony began on January 29, 1888, feast of his patron Saint Francis de Sales. A long line formed of priests and students to receive a final blessing. As the bells tolled the morning Angelus on January 31st, John Bosco breathed his last, surrounded by his faithful sons. Be devoted to the Blessed Virgin. Consider bad reading worse than the plague. Avoid bad companions even more than poisonous snakes.